The first time I saw the talent of Connor Wright was a dinner show, November 2015, in his amateur days. I had the privilege of sitting beside former English champion Ross Burkinshaw at the Jurys Inn in Milton Keynes, taking in a night of entertainment from MK Victors. This was the post head guard era, as young lads fought for nothing but pride and experience for the enjoyment of those gathered around smartly decorated tables and sporting their suits, ties and dinner dresses. A few lads stood out that night; a young Asian boy who told me how he was inspired by Amir Khan and was determined he too would go on to achieve world success. Not arrogant, confident. Another, older boy stuck in my memory. 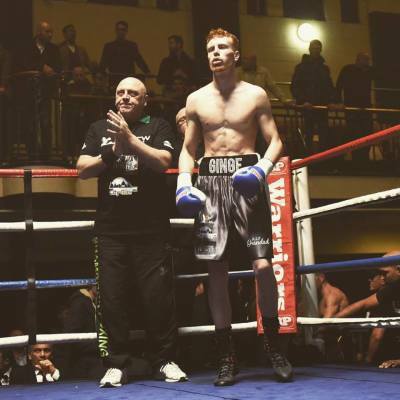 Flame haired and highly touted by his coaches, Connor Wright was fighting. "He's got a ferocious backhand has Connor" I was told by one of the strangers who had made me welcome at their table. "Beautiful timing, people just walk onto it". He demonstrated for me, in case of doubt, the timing of the backhand. Conor fought well that night, but was never quite able to detonate that left hand of his. But he showed promise. A lot of promise. Big and strong, his style didn't seem a natural fit in the amateur game. The breaks were too soon, times when he would have benefited from the ability to manipulate a hold and position his opponent, but the referee was having none of it. Fast forward two years and Connor was all set for his debut, December 1st 2017 down at the famous York Hall in Bethnal Green. Sam Omidi from Machester stood opposite; a few losses on his record these days but still a live opponent, one who would relish the chance to take out a debutant upstart. He may have been far from home, but Omidi had been through this process before. For Wright, it was the first time that his vest stayed in the changing room. What many don’t realise when they cheers from the balcony of York Hall, or take their seat ringside, is that although it is a fantastic spectacle to watch boxing there, the conditions are somewhat different for those taking part. Connor found out first hand that glitz and glamour doesn’t follow everyone around the boxing world. It's fair to say that Milton Keynes is a boxing back water when it comes to the professional side of the sport. Despite two amateur clubs (MK Victors and Bletchley ABC) and a hugely popular white collar scene, the most recognisable name to come from the young town was Anthony Joshua victim Matt Legg. With a football team procured under dubious circumstances that now brings in big crowd numbers, it is a town with a sporting appetite. Wright is keen to exploit the gap in the boxing market. 20 is too young for some to ply their trade as professional pugilists, but for Wright it seems to be the correct time. He admits though that his age makes it difficult to be taken seriously, both by others and at times, himself. That next outing is closer to home than his debut, boxing on Sunday February 18th at Bedford Corn Exchange. As well as those friends, family and colleagues that he hopes will make the short journey, he is hoping that he can start to build a wider reputation in the boxing community. For that, he wants a test. ​It is back at Wright's old amateur club, MK Victors, where I meet with him. His coaching team has stuck, the same faces in the corner have helped the transition from amateur to professional. Familiar surroundings haven't bred contempt; the walls sweat as much as those training. There's an old school feeling, yet cleaner. No luxuries, but essentials. The club is bustling with plenty more young faces that are learning the art, hoping that one day they too can follow Connor's steps, walk out under the bright lights. It is has father, Tony Wright, alongside coach Adam Boniface that have been key in bringing Connor from young boy to young man. With over 50 amateur bouts cornered by the team, they were always going to be the people to bring him to the ring as a professional. It's not just dad who is involved with the MK Victors club. His mum is integral, picking up the paperwork and admin where dad holds the pads. She beams with pride when talking to Connor about his sparring today at the Peacock Gym in London; her work colleagues were shown the footage. As much as with all helpers at such clubs the hours can be long and often go unnoticed. She is also very aware that boxing has kept her son out of potential trouble in everyday life, given him the discipline that means his fighting is done in controlled circumstances. She still recoils though at the thought of her young boy getting in the ring. “I have to watch between my fingers” she says, hands to her face. As well as a growing understanding of business, Connor is learning the art of social media in an attempt to build his following in the boxing community. With the recent downfall of Ohara Davies via the platform of Twitter, there are obvious lessons to be learned while borders of what is acceptable are still being drawn out. It’s something he is conscious of. Allen has made a huge success from self-confessed limited talents, in part from his outstanding personality and willingness to engage with fans. He could be the perfect role model for young Connor Wright to follow. He exudes the confidence and energy of a hungry and excitable 20 year old. His fundamentals of a caring family, a reliable income outside the ring, well-schooled skills and an already blossoming set of fans means that Connor has every opportunity to make a success in the sport. He has growing to do, both physically and mentally. His style in the ring will evolve and his priorities change. Like the foundations of the houses he sells in the day, the base is solid. Now it is time to build.